Prague Castle looks almost like a small town itself. It is the largest ancient castle in the world (570m long and on average 128m wide). 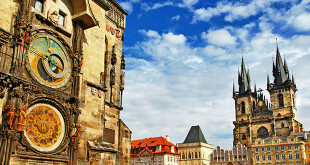 It is also where the Czech kings, Holy Roman Emperors and presidents of the Czech Republic used to have their offices. It is not surprising that this is the most visited tourist attraction in Prague. Prague Castle is a sprawling complex situated atop a large hill on the left bank of the Vltava River, which runs through the old town of Prague. The neighbourhood of the Prague Castle is called Hradcany. It is not exactly a “classic” castle because portions of it were built in different styles and it spreads out more horizontally than vertically. But inside the majestic castle there are many sights and attractions. The main feature is St.Vitus cathedral, an interesting 14th century Gothic structure adorned with fascinating gargoyles that can easily be seen from ground level. Inside St. Vitus are some very elaborate tombs, redolent of Czech history. It is possible and worthwhile to climb to the top of the bell tower, which takes you to the highest point inside the castle. From the top, there are fabulous views of the castle and the Old Town of Prague. Elsewhere around the castle are further places of interest. There is the “Golden Lane,” a series of small, colourful shops that originally served as housing for the palace guards; the throne room for the reigning kings of Bohemia, a great hall that looks like it hasn’t changed in 500 years; the outstanding monument of St George’s Basilica; the Czech art museum, and a short walk away is Lobkowicz Palace. Beyond Golden Lane, the Daliborka Tower is named after a nobleman who was imprisoned here on suspicion of complicity in a peasants’ revolt. In the Mihulka (Powder Tower), alchemists were once employed to discover the secret of turning base metals into gold. There’s also a toy museum, which really has nothing to do with the castle, but contains some very interesting old and new toys. The changing of the palace guard is an entertaining affair (every hour on the hour at the main gate) – a sort of poor man’s version of London’s Buckingham Palace routine. Prague Castle is a seat of the President of the Republic. It is also historical and political centre of the city and our state. Two monumental statues of battling Titans over the front gate set the mood as you enter into the vast castle complex, which includes a palace, three churches, royal stables, a monastery and of course the manicured surrounding gardens. Supreme and towering over Prague is the magnificent and huge St Vitus cathedral. Tip: Prague Castle Guided Tour can be booked here. The castle dates back to the 9th century when Prince Borivoj founded and fortified a settlement here. During the 12th century, a Romanesque palace was built, and then during the 14th century, in the reign of Charles IV, it was rebuilt in Gothic style. The last reconstruction of the Royal palace was made under the rule of the Jagellons at the end of the 15th century. In that time the famous Vladislav Hall was built, constructed in late Gothic style (1497 to 1500, by the builder Benedikt Rejt). An enlargement of the castle took place in 16th century after a big fire in 1541. The Spanish Hall in a new part of the castle was built in the reign of Rudolf 11, and it assumed its final form later on, during the reign of Empress Maria Theresia (1743 – 1780), designed according to the plans of architect M. Pacassi. After World War 1, the interior and gardens of the castle were redesigned by architect J. Plecnik. The changing of the guard at Prague Castle takes place every hour from 5am to 11pm on the hour; at noon sharp it is accompanied by a solemn fanfare. Long tour: Old Royal Palace, permanent exhibition “The Story of Prague Castle”, St. George’s Basilica, Convent of St. George – National Gallery, Golden Lane with Daliborka Tower, Prague Castle Picture Gallery. Short tour: Old Royal Palace, St. George’s Basilica, Golden Lane with Daliborka Tower. How to get to Prague Castle? Tip: Take the tram up to the Castle and walk back down when you wish to go back to your hotel. As a starting point we recommend the metro station ‘Malostranská’ (line A) which is situated just below Prague Castle. From there you will step up on Old Castle Stairway (Staré zamecké schody) directly to the castle gate. Another recommended option is from Lesser Town Square via Nerudova Street: a bit of a steep walk. You will end up in front of the main entrance to the Castle. If you prefer not to do such a steep walk up Old Castle Stairway you might take a tram (no.22 or no.23) up to the hill to the get off at the stop for Prague Castle (Pražský Hrad). You can get on the tram in several places, these three stops are especially convenient: the Národní Třída Metro stop; in front of the National Theater (Národní Divadlo); and at Malostranská (the Metro stop in the Lesser Town). Královský letohrádek (Belveder) – start with the Royal Garden, Belveder and Ballgame Hall, then cross the Deer Moat bridge to get to the Second Courtyard. The Royal Garden and Deer Moat are closed from November through March. Pohořelec – walk to the Castle through Hradčany and you will arrive at the main entrance. Or if you prefer comfortable transport, use our taxi service. Visitors gradually squeeze through a fortified doorway at the castle’s bottom area. From here, they can go to the closest tram/Metro station, the Little Quarter, Castle Square or the Strahov Monastery. To get to Malostranská Tram Station/Metro: Tourists can take the steep path to return straight to the river-bank…or go right approximately half-way down the stairs to see the gardens at Furstenberg, with 2200 rose bushes and 3500 blooming plants (80czk, April to October each day from 10:00 until 1 hour prior to sunset). For a more gradual descent, begin walking down the steep path. Around forty yards beneath the castle’s exit, a gate to the left takes you across a picturesque vineyard passing the restaurants at Villa Richter. To get to Strahov Monastery via Tram: Follow the above directions to Malostranská tram/Metro station, then take the tram to the stop at Pohořelec. To get to Castle Square (& Monastery) or Little Quarter: Once you depart the castle’s gate, turn sharply right and walk through the meandering, beautiful park. Midway through this lengthy park is a view surveying the terraced gardens at Pálffy (80czk, April to October each day 10:00 to 18:00, shut November to March). You could crisscross down these gardens to the Little Quarter. Alternatively, if you wish to stroll to the Castle Square, carry on uphill alongside the castle’s wall and across the garden towards the square. From there, you could trek up to the monastery. Entrance fees are required for a few selected areas but visitors can walk freely through the grounds and even into the larger portion of the cathedral. A collective ticket can be purchased at the information office. Allow a minimum of four hours for a visit. Other information can be found on the official website for Prague Castle. The neighbourhood of Prague Castle is called Hradčany. Most monuments within Prague Castle complex are open daily Apr-Oct 9am-5pm, and Nov- Mar 9am-4pm. The castle complex alone is open from the very early hours until 11pm or midnight. Castle complex is open daily from 5:00 to midnight. Places where tickets are required are open from 9:00 to 18:00. Prague Castle Gardens together with Deer Moat are open according to the months: April and October from 10:00 to 18:00, May and September from 9:00 to 19:00, August from 9:00 to 20:00, June and July from 9:00 to 21:00. Castle complex is open daily from 6:00 to 23:00. Places where tickets are required are open from 9:00 to 16:00. Prague Castle Gardens, including the Deer Moat and the Riding School Terrace, are closed. Allow a minimum of four hours for a visit. Do not miss Golden Lane but, if you are tempted do some shopping there, be aware that this is the most expensive shopping area in the whole of Prague followed by Pařížská Street. If you are planning to visit Prague Castle on your own and other sights in Prague as well, consider buying a Prague Discount Card for substantial savings. Ask our driver or visit our website for more info. Dining or even lunch at Prague Castle can be very nice but surely very expensive too. If you are visiting the castle with children you might wish to visit Toy Museum. Avoid huge crowds of tourists visiting castle during peak times, mostly from 9:30 til 12:30. Free access area in St. Vitus Cathedral is among the most crowded part of the castle complex. Bear in mind that the majority of groups stick to the free of charge zones. However, If you are not curious about entering the sights interiors, why not consider a nighttime or late afternoon visit-the castle. When is the Changing of the Guard? The ceremonial Changing of the Guard including a fanfare and the flag ceremony is held daily at 12.00 in the first courtyard. The Changing by the Castle gates is held on the hour from 7.00 to 20.00 in the summer season and from 7.00 to 18.00 in the winter season. Is it Possible to Visit the State Rooms? Rooms used by the Office of the President of the Czech Republic are open the first Saturday after May 8, as a rule. The gardens are freely accessible in the summer tourist season (April 1 – October 31). The South Gardens will be open this season from June 20 due to technical reasons. 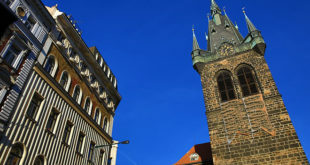 Historical monuments and exhibition halls, except towers (Daliborka Tower, White Tower, Powder Tower, Cathedral Southern Tower) and the defence corridor in the Golden Lane, offer barrier-free entrances.